I’m sure I’ve made it clear how much I love my CZ75B. It was the first gun I ever purchased. It’s insanely accurate and the weight of the all steel frame makes for minimal felt recoil. And in the over three years that I’ve owned this gun the only modification that I’ve made to it, was the addition of rubber grips. My CZ75B is full sized so it didn’t seem that much of a stretch for me to plan to use it for the Lady’s 3Gun Pro-Am this coming October. However, during my recent practice one of my coaches informed me that I was “fighting” my gun. “Fighting the gun” is a term my coaches use regularly and it means that the gun isn’t the best possible fit for the shooter. This is not to say that the gun isn’t a great piece of equipment or that the shooter couldn’t use this gun and succeed. “Fighting the gun” just means that the shooter would have to accommodate their natural abilities to use the gun to its fullest potential (and to theirs.) Basically, my coach thinks the CZ’s grip is a bit small. After he puts a heavily modified Glock 34 in my hands, I have to agree. Not only do I grip this pistol, better from the get-go, but I’m also hitting my targets faster and more regularly. At the same time, I love my CZ and I don’t want to see it benched. But why should I handicap myself from the start? It actually took me a few nights of tossing and turning to accept this change in line-up. Somehow I feel a bit like a traitor, or a sell-out. Then I began to push aside the emotion and considered the tool and the job. My CZ is great, but it has no modifications done to it. A quicker lighter trigger, a longer barrel, better sights and an enlarged mag well, would all make this gun better suited for competition. With CZ-Usa, doing all of these mods takes time and funds. There are very few drop in parts for the brand so I would have to send my pistol to Arizona and lose valuable training time. Even once it returned, it would still have too small a grip. I have finally decided to borrow and train with, a competition ready Glock 34 9mm. This gun is on loan from Janna Reeves, friend & member of the Noveske Shooting Team, though I think I have already fallen in love. The Zev trigger weighs in at less than 5lbs (trigger weight measurement sponsored by Brownells) and the reset is really improving my pace. The finger grooves have been removed and the trigger guard was cut down, making the grip fit me perfectly. Also, the mags hold one more round than my CZ’s 16, which isn’t a huge improvement, but it cant hurt. All in all, I’m happy with the change. I still keep my brand preference as it has always been, but once I was able to put my emotions aside, I was able to prefer the best tool for this job. Holding on to the familiar and not trying new things will doom you to the past. Taking on challenges big and small will prepare you for the future. Very good point. Though there has been no doom in my CZ thus far. I hope the challenge is competing in general and not the changing of gun. You know, they make larger grips for the CZ. My thought too. Finding intermal parts and tuning takes work but grips, even custom jobs, are just a few mouseclicks away. If you’re willing to sent it out to a smith, you might see the reason the CZ type pistols are in the hands of several production GM’s. I second what John said, Czech them out and stick with your first choice, make it what it needs to be for you. Comparing a trigger on a raced out Zev Glock to a stock CZ is invalid in my opinion. 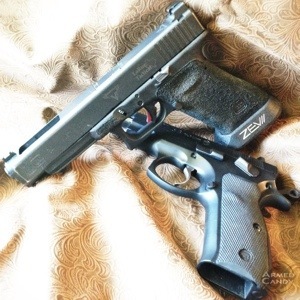 Both the Glock and the CZ are good guns, and both can benefit from competition parts to make them your own. Chances are, having your already-paid-for CZ modified to a level you can shoot pretty much as well as a tricked out competition Glock will likely cost less. Comparing a pretty much bone-stock gun to a highly refined and tweaked competition gun is like comparing an off-the-lot Chevy Malibu to a NASCAR stock car that happens to look like a Malibu. If your coach thinks the CZ is too small for your hands, that is a REALLY easy fix that requires no gunsmithing and very little money.